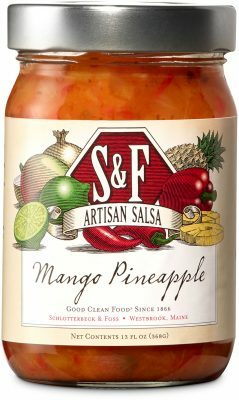 This sweet salsa is loaded with chunks of mango, fresh pineapple, red bell pepper, onion, lime juice, and just the right amount of jalapeño peppers to spice it up. Always great with tortilla chips. Try with grilled shrimp or fish tacos. Spoon over whipped cream cheese and serve with crackers for a quick appetizer. Mango, Pineapple, Red Bell Peppers, Onions, Cane Sugar, Water, Jalapeno Peppers, Cilantro, Lime Juice Concentrate, Sea Salt, Ascorbic Acid.